“Swan Lake,” with its easily recognized Tchaikovsky score, has been the gold standard for classical ballet companies for well over a century – a quintessential test of the technical and dramatic skills of dancers. And while it has been subjected to countless interpretations and pop culture sendups over the years, its essential fairy tale-like darkness, disturbing psychological overtones about the illusion and unreliability of love, and abiding feathery beauty remain touchstones of this most demanding art form. It has been four years since the Joffrey Ballet first performed Christopher Wheeldon’s reimagining of “Swan Lake,” which lifts the story out of a Brothers Grimm-style kingdom and sets it down in the world of the Paris Opera Ballet at about the same time Tchaikovsky was penning his score in Russia and Degas and Toulouse were painting dancers and cabaret artists in Paris. And its current revival, which opened Wednesday night for a two-week run at the Auditorium Theatre, serves as a vivid indication of the extraordinary artistry that now defines the Joffrey, from principal dancers to corps. Grabbing hold of the notion that not everything was beautiful at the ballet in late 19th century Paris – where wealthy male patrons were widely known to exact “favors” from their favorite young female dancers – Wheeldon’s “Swan Lake” is a ballet-within-a-ballet. It interweaves a look at a dress rehearsal of “Swan Lake” that is fueled by the painful real-life paranoia of the leading male dancer playing Prince Siegfried, and the feverish emotion he brings to the performance of his role. 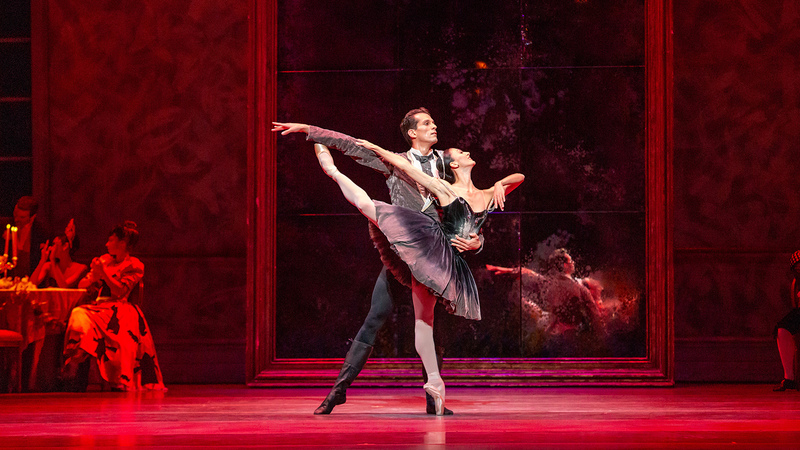 The dancer fears that a wealthy older Patron of the Paris Opera is wielding control over his partner, who is performing the dual role of Odette/Odile, the beautiful swan who flips from a loving white swan into a severe and chilly black swan. And as he performs his role, that Patron morphs into the evil magician, Rothbart, who demonically controls his flock of female swans. The three leading dancers on opening night – Victoria Jaiani as Odette/Odile, Dylan Gutierrez as Siegfried and Fabrice Calmels as the Patron/Rothbart were nothing short of breathtaking. With her exquisite frame, impossibly willowy arms, wondrously expressive upper body, elastic back, and almost weightless way of moving through space, or soaring into the air, or folding into a swan-like form on the floor, Jaiani was in top form. Lyrical but strong as Odette, and ideally cool, with sharp, scissorlike moves and bristling, rapid-fire footwork as Odile (she whipped off the two dozen or more fouetté turns that are the nightmare test of the second act with gyroscopic precision), she was splendidly partnered throughout by Gutierrez. And the pair danced as one in both the white and black pas de deux. Pure poetry. In addition, Gutierrez – tall, slender and wonderfully fleet – not only sustained a superbly limned characterization as Siegfried, but danced with a whole new sense of style and confidence. He effortlessly nailed every expansive leap, pirouette and soundless landing, suggesting that he is now at the very top of his impressive game. And then there is the even taller Calmels, easily lecherous in his top hat as a Parisian boulevardier, and far more malevolent as Rothbart (aided by fabulous though uncredited makeup), who skulks around the stage, exerting a creepy power over his swan/women and suggesting a hint of John Malkovich twistedness in his portrayal. The fabled Act II pas de quatre for four Cygnets was a masterpiece of precision – danced with great polish and punch by Amanda Assucena, Nicole Ciapponi, Cara Marie Gary and Leticia Stock. And April Daly, Yoshihisa Arai and Assucena gave a buoyant rendering of the pas de trois in Act I. Every bit as impressive was the seamless dancing of the company’s female corps which is a major presence throughout, and which easily finessed Wheeldon’s many complex, coiled and circling patterns. Credit for this, and much else, belongs to the Joffrey’s excellent ballet masters – Suzanne Lopez, Nicolas Blanc and Adam Blyde – even if the comically doddering, cane-stomping ballet master devised by Wheeldon (and deftly played by Fernando Duarte) would suggest otherwise. On the other hand, Wheeldon invariably assembles terrific design teams. Jean-Marc Puissant’s costumes add a fine note of French panache. And Adrianne Lobel’s set of a giant gilded mirror, wallpapered walls and French doors, combined with abstract swan projections and lighting by Natasha Katz (recreated by Christine A. Binder), put a subtly modern touch on 19th century grandeur. The Chicago Philharmonic and music director Scott Speck do the rest with their always sensitive attention to the dancers. Note: There are several alternating casts for “Swan Lake,” with April Daly, Jeraldine Mendoza, Christine Rocas and Amanda Assucena as Odette/Odile; Miguel Angel Blanco and Alberto Velazquez as Siegfried; and Temur Suluashvili and Rory Hohenstein as Rothbart. “Swan Lake” runs through Oct. 28 at the Auditorium Theatre, 50 E. Congress Pkwy. (recently renamed 50 E. Ida B. Wells Drive). For tickets ($35-$195) call (312) 386-8905 or visit www.joffrey.org. Running time is two hours and 45 minutes with two intermissions.